I think you all know by now that I love to grill. If the weather cooperates, I’m firing up the grill several times a week and the menu regularly includes salmon, steak, pork chops, or chicken. I’m always on the hunt for the perfect side dish for whatever is coming off the grill and this dish might just be that perfect side. Farro (pronounced FAHR-oh) is an ancient whole grain that is an excellent source of complex carbohydrates. Additionally, farro has twice the fiber and protein of modern wheat. Popular in Italy since the Roman times, this wonderful grain has found it’s way to this side of the Atlantic and I regularly find it on the menu at some of our favorite restaurants. Farro is a wheat type grain and there is some discrepancy about exactly what farro is. 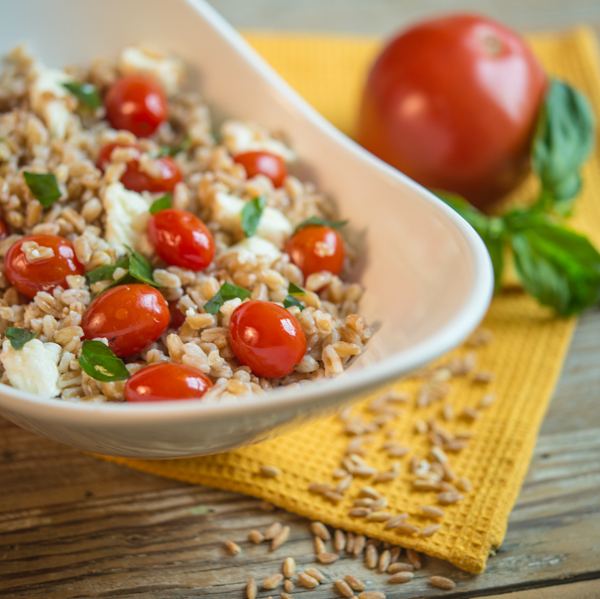 In Italy, three different grains are called farro: einkorn, emmer, and spelt, and they are called farro piccolo and farro medio, and farro grande, respectively. This salad makes a light, refreshing, and healthful side to almost any meal. If you haven’t tried farro, by all means, do so. 1. Bring 2 quarts of water to a boil in a medium large pot. Add 2 teaspoons of salt and farro to boiling water. Simmer for 20 minutes. Drain, rinse with cold water, and set aside in a large bowl. 2. Heat 1 tablespoon of olive oil in a medium skillet over medium low heat. Add whole tomatoes and cook for 3 to 4 minutes until the skin is just beginning to soften, stirring regularly. Remove and cool completely. 4. Tear mozzarella into small bite-sized pieces and add to farro. 5. Tear basil leaves into small pieces and add to farro. 6. Add cooled tomatoes to farro and mix gently. 7. Whisk vinegar, agave nectar, 1 teaspoon of salt, pepper, and 4 tablespoons of olive oil. 8. Pour over farro mixture and mix well. 9. Salad can be made ahead of time and refrigerated but should be served at room temperature. Hola, Bill–another tasty item on your site….but down here, we have limited access to unusual food…do you think we could use wheat? or how about couscous? bulgur? would it not have the same flavor intensity? Gracias!